(TibetanReview.net, Mar29, 2017) – The national flag of Tibet was on Mar 26 raised at the Nipponsan Myohoji Buddhist Temple in Milton Keynes, the administrative centre of the Borough of Milton Keynes in Buckinghamshire, located about 45 km northwest of London. It was an annual event attended by the mayor and Mayoress of the city and the exile Tibetan administration’s London-based representative Mr Chonpel Tsering. The event was organized by Ms Catherine Mostyn Scott who started it in 2014. About 80 people attended the flag-raising event which was addressed by the Mayor as well as by Catherine Scott. 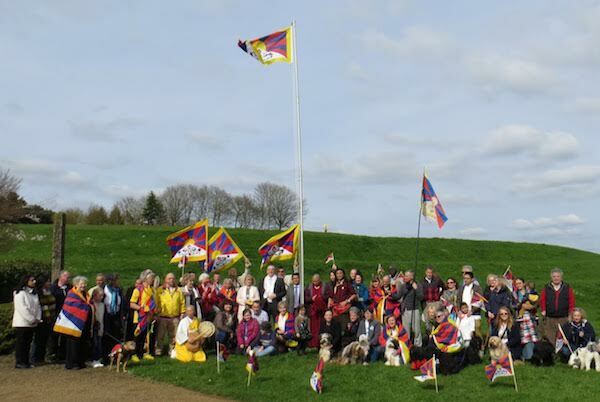 The event concluded with a team of flag-bearers, and 14 Tibetan Terriers, racing round the nearby Willen Lake to raise awareness about Tibet, said the London-based Office of Tibet Mar 28.